It is common, where there are minor children, for a divorce agreement to require at least the payor of child support and sometimes both parties to maintain life insurance with the children as beneficiaries. 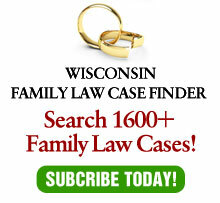 A recent unpublished, but citeable, Wisconsin Court of Appeals case has implications for some of these divorce cases. The case at hand is McDonah v. McDonah, No. 2014AP712, released Dec. 23. It involves Carly and Nellie McDonah, whose parents divorced in 1999 when Carly was 10 and Nellie was 7 years old. The divorce judgment ordered their father, Gerald, to pay child support until each child became self-supporting and also required each party to carry life insurance in the minimum amount of $100,000 with the children named as the irrevocable beneficiaries. Gerald maintained the requisite life insurance policy until Nellie, the younger child, graduated from high school. At that time he changed the beneficiary to his then-current wife, Candice. When Gerald died in 2012, the life insurance proceeds were paid to Candice. Carly and Nellie sued Candice for a constructive trust over the life-insurance proceeds, asserting the divorce judgment required Gerald to maintain them as named beneficiaries into perpetuity. The trial court granted judgment in Candice’s favor, and Carly and Nellie appealed. The parties agreed that the essential issue presented was whether the settlement agreement’s life-insurance provision was intended as child support or property division. The Court of Appeals held that a life-insurance requirement for children in a divorce judgment applies only while the children are still minors. Since the life-insurance provision terminated together with other child support obligations after Nellie’s graduation from high school, Gerald was allowed to change the beneficiaries of his policy. MSAs without a termination date for life insurance are an example of sloppy drafting, which occurs frequently among pro se parties and sometimes even by lawyers. A well drafted MSA would consider this issue, in particular because maybe this requirement should not terminate when the children are 18 and out of high school. Given many people’s failure to save sufficient money for their children’s college, I usually recommend that this requirement continue until the children are finished with their undergraduate education or a certain age (such as 22 or 25), whichever comes first. The primary point is that lawyers need to consider this issue – and similar ones, such as health insurance – and not rely on the Court of Appeals to bail them out. Although the court reached the rational decision in this case, they could have used Tensfeldt to rationalize a different answer. More importantly, lawyers can help their clients by considering how long such requirements should last and negotiate accordingly.